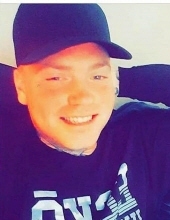 John David Boyd, Jr. beloved son, brother and friend passed away Sunday, March 31, 2019 at the age of 23 in Conroe, Texas. John was born May 18, 1995 in Conroe, Texas to Angel Pearson and John Boyd, Sr. He attended Willis High School. He worked in construction for many years. John loved to cook and grill. He enjoyed entertaining his friends and family. John was comedian. He loved to tell stories and pull pranks. He was always laughing. John had a passion for loud music. The bigger the speakers the better. John is survived by his mom, Angel Pearson and step-dad Chad Pearson and his father, John Boyd, Sr.; Grandparents, Janora Miller and Kenneth Miller, John Soliz and Georgeann Soliz, Patsy Thompson and Tommy Thompson; sister, Taylor Shiller; brothers, Jordan Shiller, Joseph Miller and Hayden Trow and wife April; Aunts, Tina Westerman, Jennifer Soliz, Susan Matthews, Hope Soliz and Margaret Soliz, Kellie Wiede and husband Ronnie, Tracey Kopecky and husband Charlie; cousins, Jada Westerman, Miranda Loyd, Alyssa Matthews, Austin Matthews, Cheyenne Montgomery, Candice Montgomery, Ciarah Wiede, Chase Kopecky, Taylor Kopecky, Carrie Riportella and Gracie Kopecky; and many close friends John considered family. John is preceded in death by his uncle Michel Miller. Visitation will be held from 2pm to service time at 3 pm, Monday, April 8, 2019 at Mc Nutt Funeral Home, located at 1703 Porter Rd. Conroe, TX 77301. An immediate burial to follow in Conroe Memorial Park. In lieu of flowers, donations can be made at Woodforest National Bank under Supporting John Boyd. To send flowers or a remembrance gift to the family of John David Boyd, Jr, please visit our Tribute Store. "Email Address" would like to share the life celebration of John David Boyd, Jr. Click on the "link" to go to share a favorite memory or leave a condolence message for the family.